All design work and manufacturing is done in-house. 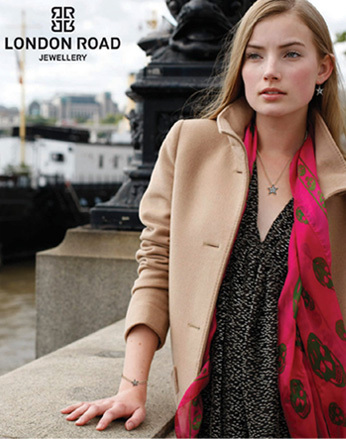 London Road is proud to have its own talented pattern makers and goldsmiths who create London Road collections from sketches and design breifs from Ed and Suzanne, and have the skills to work tight margins, while producing a quality product. Each collection takes three months from inception to completion. For more precise patterns the company uses CAD. For a more organic look patterns are hand-made, firstly in silver, which allows for experiment with different textures and finishes. Portobello Starry Night – Comprising stars and moon set with especially cut rose gold diamonds, finished with black rhodium, and gold 3D and open framed star and moon pendants, earrings and bracelets. The inspiration for this was from a beautiful vintage star brooch.